The rivalry between Vivo and OPPO has reached its peak last month, causing the two brands to launch their new flagship smartphones that offer tricky features and powerful specs. Initially, Vivo released its new flag-bearer phone that gives consumers a near bezel-less experience, the Vivo NEX S. Having a huge 6.59-inch FHD+ Super AMOLED screen with 2130 x 1080 pixels, it delivers a unique 19.3:9 screen aspect ratio and a 91.24% screen-to-body ratio. To make this possible, the company intros its in-display fingerprint scanning technology that allows its panel to transform its entire bottom half into a fingerprint sensor. Moreover, the entire FullView Display doubles as a speaker via SoundCasting Technology. It also sports an elevating selfie snapper. With these innovative features, the Chinese mobile manufacturer has upgraded the smartphone game of its segment. However, OPPO quickly unleashed its answer through the launch of its Find X smartphone. In case you missed it, the Find X dethroned the NEX S for having a highest screen-to-body ratio. Dressed in a 3D Glass body, the phone flashes a smaller 6.4-inch display, though it comes with 93.8% screen-to-body ratio – the highest on a smartphone till date. Just like its rival, OPPO’s handset also ditches the notched display, while adding more innovative features, including its pop-up camera design that is also known as the stealth 3D camera. While both smartphones aim to offer a real bezel-less experience to users, which device has something more to offer? With that, let’s put them on our battle sheet to see who deserves the crown on its segment! See Also: OPPO Find X Is Priced at Php49,990! Diving deeper, the OPPO Find X and Vivo NEX S obviously have their own edges to battle out their opponent. In fact, choosing who has the upper hand even on one department gave us a hard time. For instance, the NEX S has a bigger 6.59-inch Super AMOLED screen than its rival’s 6.42-inch AMOLED panel. But, OPPO bounces back with its 93.8% screen-to-body ratio, and 19.5:9 aspect ratio to beat the other side’s 91.24% and 19.3:9 respective offerings. The Find X also boasts a Corning Gorilla Glass 5 protection, giving it an additional point to win this match. Technically, both companies eye to give a real bezel-less experience to its users, so, the brands came up with new tricks to deliver this to the market. OPPO equips its Find X with pop-up cameras to eliminate the space that a usual front sensor occupied. Downside? It also lacks a physical fingerprint sensor. It boasts a 3D Facial Recognition technology instead, which is called as O-Face. On the other hand, the NEX S is packed with more innovative features. For security options, the device carries an in-display fingerprint scanning technology that transforms its screen’s entire bottom half into a fingerprint sensor. Moreover, the panel also works as a speaker through its SoundCasting Technology. It comes with Face Unlock technology, too. And just like the Find X, it sports an elevating front camera. Speaking of camera, let’s move onto their photography department. Here, the Find X finds its way to regain its rhythm. It is geared with better pop-up 16-megapixel f/2.0 + 20-megapixel f/2.0 main cameras compared with its opponent’s 12-megapixel f/1.8 + 5-megapixel f/2.4 dual rear sensors. OPPO also has a more capable 25-megapixel selfie snapper, dumping out its rival’s 8-megapixel front shooter. Nevertheless, NEX S is loaded with a huge 4000mAh juice that supports 22.5W fast charging to accompany users on their daily mobile tasks, beating up OPPO’s 3730mAh stamina with VOOC Fast Charging Technology. However, under the hood, both phones share the same Snapdragon 845 chipset, Adreno 630 graphics, 8GB of RAM, and up to 256GB of non-expandable storage. 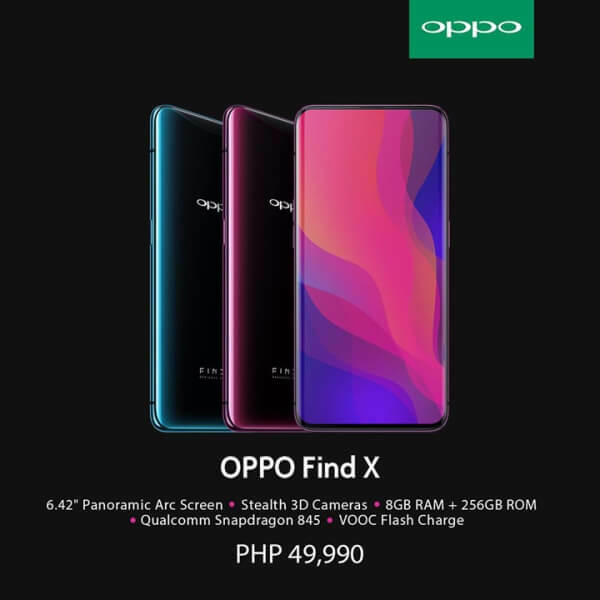 Related: OPPO Find X Is Priced at Php49,990! The OPPO Find X is now up for pre-order here in the Philippines, with a price tag of Php49,990 (8GB/256GB). Meanwhile, the Vivo NEX S is tagged at CNY 4,498 (128GB) or roughly at Php37K, and CNY 4,998 (256GB) or almost at Php41K. Which side are you on? Tell us your thoughts!